Tram chiefs have given a “100 per cent” guarantee the service will not be delayed further and will definitely open to paying passengers this month. The Evening News revealed yesterday that the long-awaited launch date is Saturday, May 31. And city transport convener Lesley Hinds is confident there will be no last-minute change of date or alterations to a plan that has been beset in the past by pitfalls, U-turns and delays. She made the claim following yesterday’s official “big reveal” at the Gyle tram stop. Cllr Hinds said: “Training and preparations have gone well and everyone is 100 per cent certain of launching on May 31. There could be a disaster of some kind but if everything goes as smoothly as it has then we are confident of accepting fare-paying passengers on that date. A press launch for the new £776 million tramline will take place on Friday, May 30 ahead of fare-paying passengers being allowed on board for the first time from 5am the next morning. The opening ceremony will be deliberately low-key given the much-maligned project’s overblown budget and missed deadlines. There will be no ribbon-cutting or bottles of champagne. Instead, city residents will be invited to join the likes of Transport Minister Keith Brown, Cllr Hinds, Transport for Edinburgh chief executive Ian Craig and Lord Provost Donald Wilson for the inaugural run. 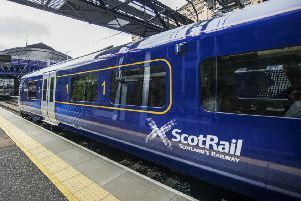 Invited members of the public understood to be taking part in the opening ceremony on May 31 include an air stewardess, an Edinburgh Park businessman, a Gyle shopper and a city centre commuter. In the run-up to the launch date, staff will be hosting various road-show events along the route to help familiarise locals with buying a ticket and understanding timetables. Those with disability and mobility issues will also be given tours of the trams and stops. Staff will also show people how to get on and off and validate a ticket. A full timetable and ticket prices will be announced – however it is already known a single adult fare will cost £1.50, while a child’s ticket will cost 70p. Mr Brown said: “Now that we have a confirmed date for the first passenger service it’s time to look forward with confidence.